Long Description: Food will be provided Saturday Night through Sunday Lunch. This is a moderate difficulty event. We will be learning about the use and care of Cross Cut Saws to cut downed trees off of the trail. There will be a practical use of your learned skills on downed trees in the area near the class and camp location. We will be working in beautiful mountain forests and gorgeous granite near the Old Minarets work center probably along the San Joaquin River Trail. Food will be provided Saturday lunch through Sunday lunch. Crew will drive and hike in and out of work area. (Who) Partners: REI, Tioga Sequoia Brewing Company and the U.S. Forest Service are sponsoring this event. (Where) Sierra National Forest, High Sierra Ranger District, (meeting point) Kokanne Work Center at Huntington Lake 1.5-2 hours from Fresno. 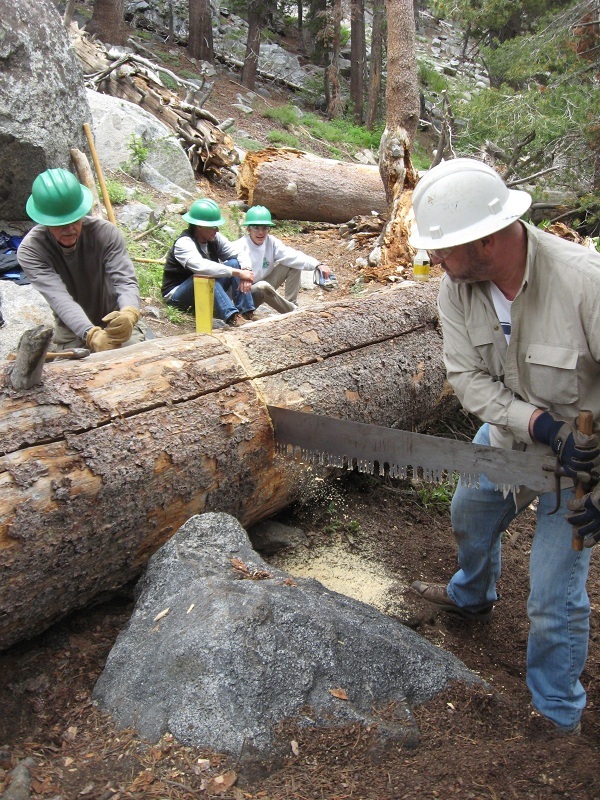 (What) The goal of this project is to learn about the safe use of Cross Cut Saws and gain some practical knowledge of their use while clearing some downed trees from the San Joaquin River Trail to allowing the public safe and unimpeded passage. 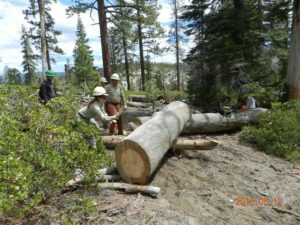 (Why) Due to high tree mortality rates, many trees are falling across trails in the Sierra National Forest making it extremely difficult to hike on established trails safely. This fact means that our crew needs to be able to cut and remove the trees with cross cut saws, this requires training and practice. (How) Experienced instructors will teach the class about the correct use of cross cut saws. The instructors will lead and train volunteers in cutting trees by hand with cross cut saws including techniques and safe usage of saws. All safety equipment for trail work will be provided, please come prepared with long pants, long sleeve shirt and boots. These items are a must when using these saws. More detailed information will be sent to you after you sign up. Cooking: We have employees and volunteers who cook for the trip. Anyone attending can help with kitchen duties during the trip. Cooking for 15-20 people in base camp setting is difficult and a lot of work. Spreading the load out among the crew is better than placing all the work on one or two people. Your support toward helping out will be appreciated! Funding: There is no charge for this event. Week long back packing trips usually cost at least $5,000 and with 15 people participating that equals $300 per person. Please consider making a donation online or bringing a donation to the event. 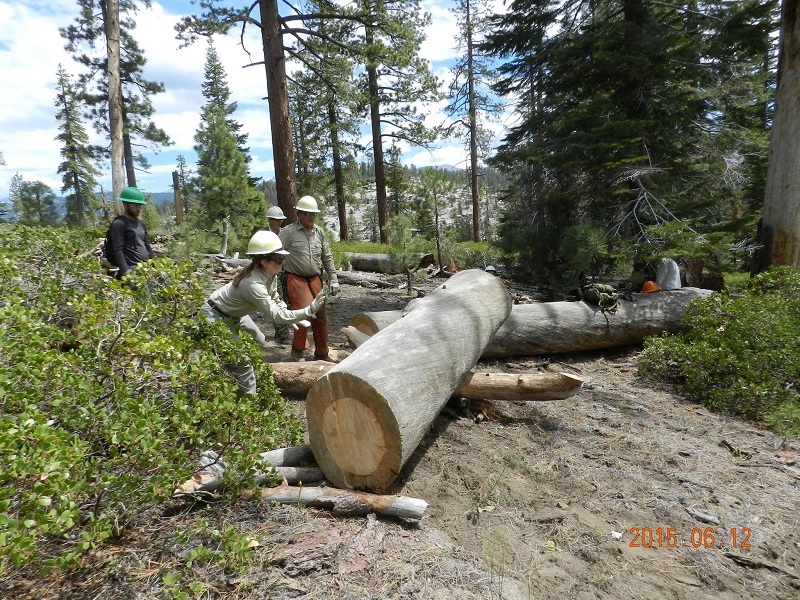 Work Activities: Cross cut saw and small hand saw use cutting downed trees. Dead brush and branches may be dragged to the site to help break the visual line of the path or cover reroutes. Activity Level: Moderate difficulty and hiking required. Meals: All meals and snacks provided.